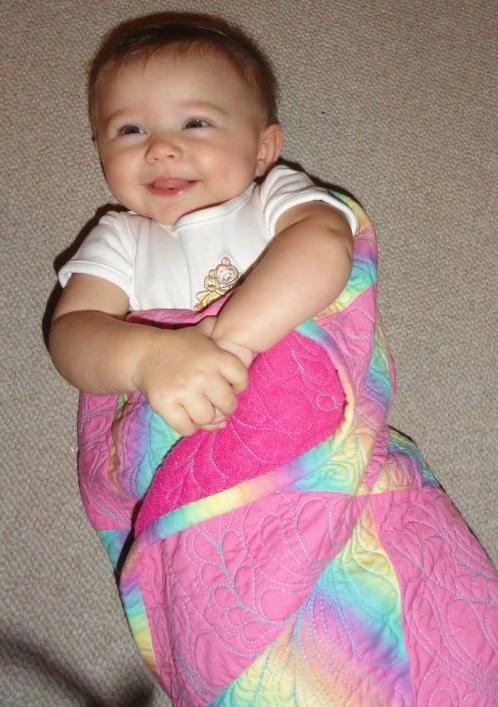 When my nephew Jack and his wife Amy had their baby, I started in on the second generation of Simms quilts. Keira received hers in the middle of last summer and here it is almost a year later and I’m finally finding time to share these pictures. I used the same technique I teach in my String Quilting workshop except that I used a striped fabric instead of piecing all the “strings.” The stripes in the fabric ran perpendicular to the selvage edge, not parallel to it as most do. That is part of what makes the quilt look a little different. I used flannel for the batting/backing and machine quilted the wonky feathers in turquoise thread. Totally free-form. All I marked were the feather veins and I went off on a tangent from there. I hope it gets as beat up as Noah’s quilt. And, don’t forget to read about the Alzheimer’s Art Quilt Initiative here. It’s terrific, all soft and pink. The quilting is extra special too! I love the “wonky” feathers. Love the quilt, baby and all! The quilting is awesome!!!! Love it! Have a great Easter! Love the quilt, that’s obvious…but your GN is absolutely adorable! Wonderful!! Cute, cute little girl, fabulous quilting and lots of pink! I love the quilting! What a lucky (and cute!) little girl! What talent. Shouldn’t waste that talent dying undies. lol Maybe quilting might be the hobby for you.- Nah.- Ami it is a beautiful quilt. baby seems very pleased to be all wrapped up in love!! sweet!! I love it!! I made a baby quilt and accesories several years ago from a “cheater” fabric ie. a panel. The panel was a scene of a giraff and all the different animals in a garden. It also had panels for a stufed giraff and a story book. It was so colorful and I had great fun quilting in even thosh it was not pieced. love the quilt and the baby’s happy smile! She clearly loves the quilt, too! What a lovely quilt. And the baby is just precious!! Congratulations to all! Gorgeous quilt for a beautiful baby. How pretty. I love string quilts and never thought of using a stripe. Love the quilting!!! Beautiful quilt, beautiful child, love the tie dye effect and the quilting ties it all together. I am sure it will get as much use as your grandson. Worth every minute of waiting! Love the feathers! Did I see a face or two, or three in the wonkiness?!! What a great idea…bet that baby will wear all the fuzziness off that flannel! Great quilting, Ami. from your student Mona in Houston.